A lpineglow candles are crafted using all-natural soy wax because of our vision of healthy people living in a healthy environment. 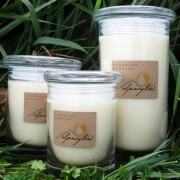 Our “green” family business creates these candles using 100% wind power and we reduce, reuse & recycle. These candles burn cleaner, longer, and are more fragrant. When you are done burning the candle, clean the glass with soap and hot water and reuse the elegant and distinctive container. Our Silky Soy with shea butter contains valuable phytonutrients, giving it remarkable healing properties. Silky Soy wonderfully rich moisturizer contains all-natural soy, shea butter, selected botanical oils and skin-safe fragrances. Rub our moisture bar all over to nourish, moisturize and heal dry areas – especially hands, elbows and heels! Your skin may feel slightly oily at first, but the goodness soon soaks into your skin leaving it feeling soft and silky. Silky Soy is also great for massages! Imagine a candle that will moisturize and nourish your skin! Replenish skin’s moisture with Silky’s warm and easily-absorbed oils. Soften and smooth cuticles, cracked hands and heels. Light the candle and enjoy. When a clear melt pool forms, extinguish the flame, and use the silky melted liquid as a luxurious lotion.